We believe we have reached the Millenium of Advanced Technology wherein most of the objects or appliances we use at home require electricity. An example of this is the Electric Stove. Who could imagine that it can be invented? In line with this, the capability of installing electrical wirings and the like is such a useful skill. Take note that there are only limited number of people who knows how to operate wires and cables and most of them are either Engineers or Electricians and they got their title by learning every component for about 4 to 5 years in college. Don't have the time to learn that long? 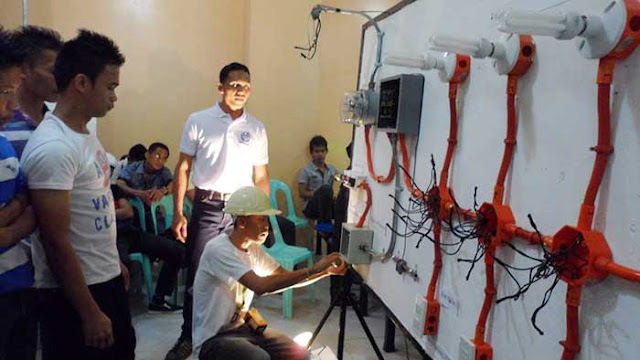 Then go and see Electrical Installation and Maintenance NC II in TESDA. It is a short course which trains you in installing and maintaining electrical wirings, lightings, and other related systems and equipment in community buildings where the only limits does not exceed beyond 600 volts. The time allotted for Electrical Installation and Maintenance NC II takes a minimum of 402 hours to complete. Students enrolled in the Electrical Installation and Maintenance NC II course may be required to undergo a competency assessment before graduation. You can take this at any TESDA Accredited Centers for Electrical Installation and Maintenance Course. A National Certificate (NC II) will be issued to students who passed this assessment process. You will find our answers on common questions about schools, tuition fee, enrollment, assessment and more in this TESDA COURSE FAQs. If you have a question that was not covered there, please leave it on the comment section below and we’ll try to answer you as soon as we can. I'd like to know how much is the cost of the training for the Electrical Installation and Maintenance NC II; and when is the the earliest schedule for training. san pwede mag enroll sa electrical installation and maintenance II... taga davao po ako..
Gud afternoon pde po ba mag enrol ung d nka tapos NG high school need ko ng nc2 12yrs po akong electrician.. Ty po. Magkano po ang tuition sa electrical installation maintenance nc2 ilang days ? TESDA Bookkeeping NC III: Course in demand!